Each measures 8" tall x 2" in diameter, with a 5.75 ounce capacity, in the classic champagne flute shape with a slender bowl top and an elegant long twisted stem. 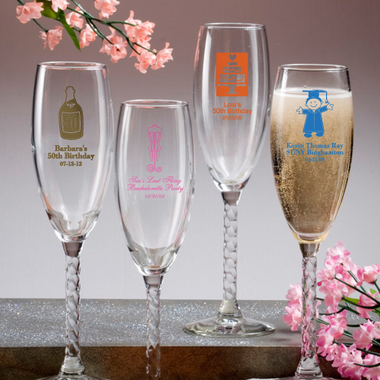 Made in the USA, each is made of clear glass and they?re perfectly fitted to be silk screened with amazing accuracy directly on the glass in a wide variety of all occasion themes, designs, colors and titles that match your theme and your personal preferences. 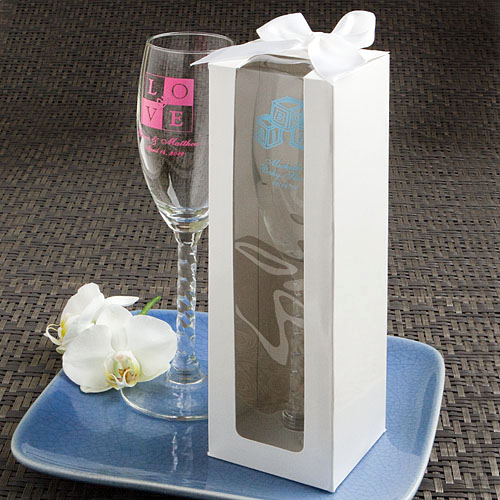 Ready to be filled with a festive bubbly beverage, these personalized champagne flute favors come bulk packed. White gift boxes are available for an additional .70 each. They are shipped flat for you to package your glasses. Their products were great and in excellent condition. Everything arrived in a timely manner. The glass and print is very good quality.